Windows is one of the major platforms for gaming and this is the OS that drives the whole PC gaming community. No matter how much people try adapting Linux for games, it will still take time. With Microsoft paying more attention to gaming with Windows 10, we can see the gaming community will rely on Windows for a long time. With the release of Windows 10, Microsoft provided a lot of things for gamers. One of them was streaming Xbox games on Windows 10 and now you can start pre-ordering games on Windows Store. The new pre-orders will allow people to pre-order ReCore ($39.99), Forza Horizon 3 ($99.99), and Gears of War 4 ($99.99) for their Windows 10 PCs on the Windows 10 and they can be pre-ordered right now. With this move, Microsoft is getting into the games marketplace which is currently dominated by Steam by Valve. There are other marketplaces like Origin, uPlay, GOG etc. but Steam is the dominating one. The thing with these Windows Store pre-orders is that if someone has an Xbox One and a Windows 10 gaming PC, they will be able to play the ordered games on both platforms while marketplaces like Steam only give you the ability to play the games on Windows, Mac, and Linux-based systems. You can call Windows Store games as a Steam competitor but technically they both have their own advantages. 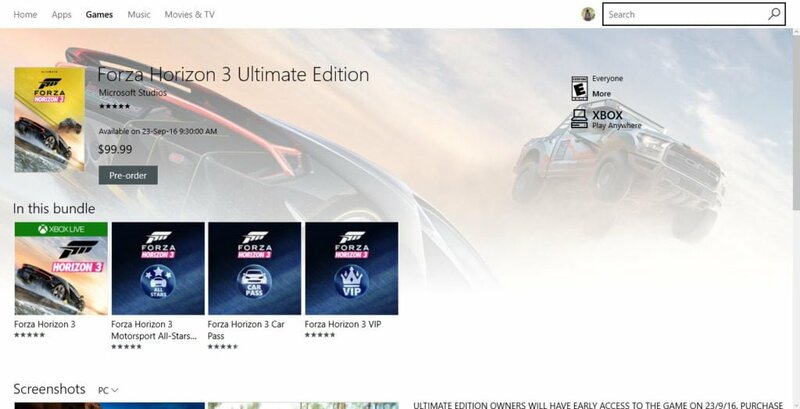 For a person with an Xbox One gaming console and a PC, ordering through the Windows Store will make more sense due to the availability of the game on both systems. Another great thing about the Xbox Play Anywhere feature is that you can sync the progress across the systems. Let’s say you played the game up until a certain point on an Xbox. You can pick up the game at the same point on a PC which is really cool.